The Exercise Improves Our Lives Poster reminds people how important daily exercise is to their health. The poster reinforces this idea with an inspirational image and quote. This poster is a great addition to any fitness or health facility. 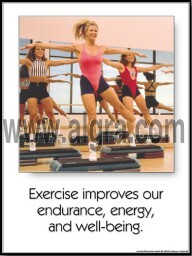 Inspirational photo with inspirational words "Exercise improves our endurance, energy, and well being" 18" x 24" poster available in Paper, Laminated, and Framed.